This post marks the first installment of a new blog series: the Lesson Lab. I wanted to create a space to explore the projects we complete in my 7th grade English class, warts and all. 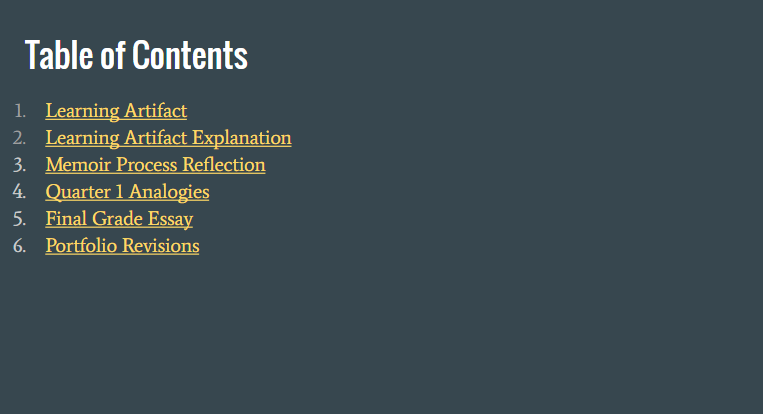 So what follows is an analysis of my most recent classroom project: photo blogs. This post tracks the project from inception to completion while providing room for commentary. I dropped each item into my brain and crunched on them for a day or two until a idea appeared materialized: a photo blog. I had recently read an Education Week photoblog on the resiliency of transvestite students, so the genre was sitting on my brain. My students would engage with the larger community around them, using images and words to investigate how we interacted with one another and how we exclude each other. I spent a couple of days perusing the internet to find suitable photo blogs. The process of finding mentor texts is one of the most time-consuming portions of any unit, I think. A tiny cottage industry has sprouted up around the acquisition and curation of teacher-vetted mentor texts (see here and here, for instance). This makes sense. Finding texts that are authentic (not from a workbook), engaging (current buzzword for interesting), not too long, and appropriate in content can be an incredible time sink. Most of the blogs I found had either too many words and not enough pictures or were too image heavy and lacking on the text side. I ended up going with Full Frame, Education Week’s online repository of interesting photo blogs and visual essays. Although the material at Full Frame deals primarily with education issues, I figured there was enough variety to interest most children: the Baltimore riots, school lunches from around the globe, the Columbine massacre, and the struggles of recent immigrant families, for instance. While not directly situated in the pop culture zone I hoped the content on the website would appeal to students’ interest in right and wrong. I also wanted to expose them to the plurality of adolescent experience across the world. 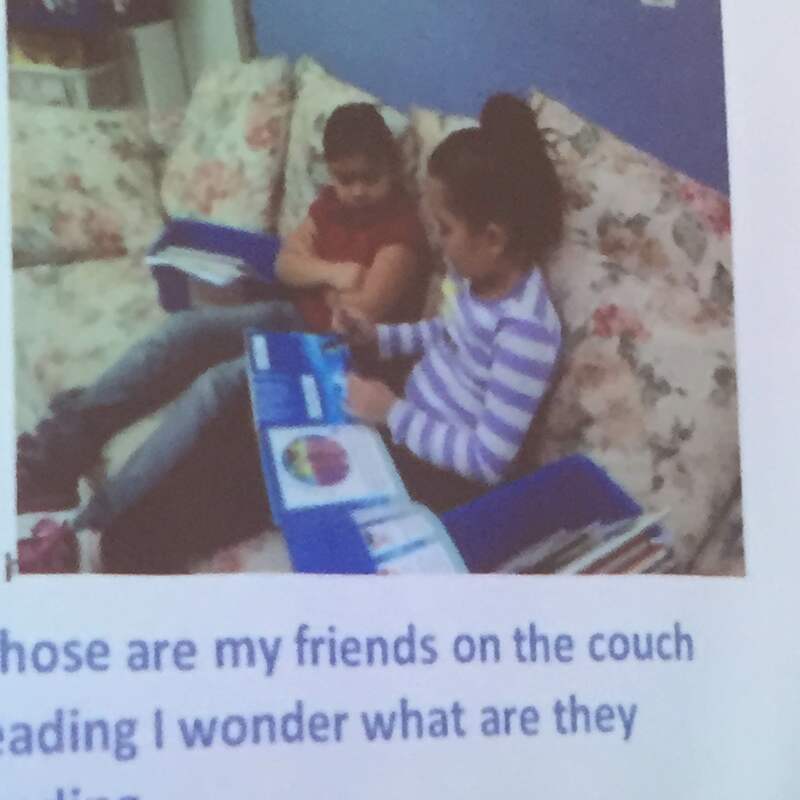 The next stage of the inquiry process is immersion, the time when students surround themselves in mentor texts in order to figure out what makes the genre work. I wanted students to dive into the photo blogs and walk around inside them. What made them tick? How were they organized? Although I LOVE making and using graphic organizers, I consciously stayed away from giving students a way to organize their noticings this time around. A big part of the inquiry approach is allowing students the freedom to come up with things on their own. Having a preordained structure or set of questions seemed to A) rob students of the ability to stumble upon their natural noticings and B) insert too much of myself into the process. In an inquiry-centered classroom, the student plays a primary role in determining the curriculum. By inserting anything he or she deems essential for understanding, the teacher contours the flow of the lesson instead of controlling it. The noticing portion of the lesson is where things began to break down. Students didn’t seem very interested in the mentor texts. In retrospect I should have spent more time finding suitable photo blogs to study. Students weren’t keen on “walking around inside” the photo blogs, either. 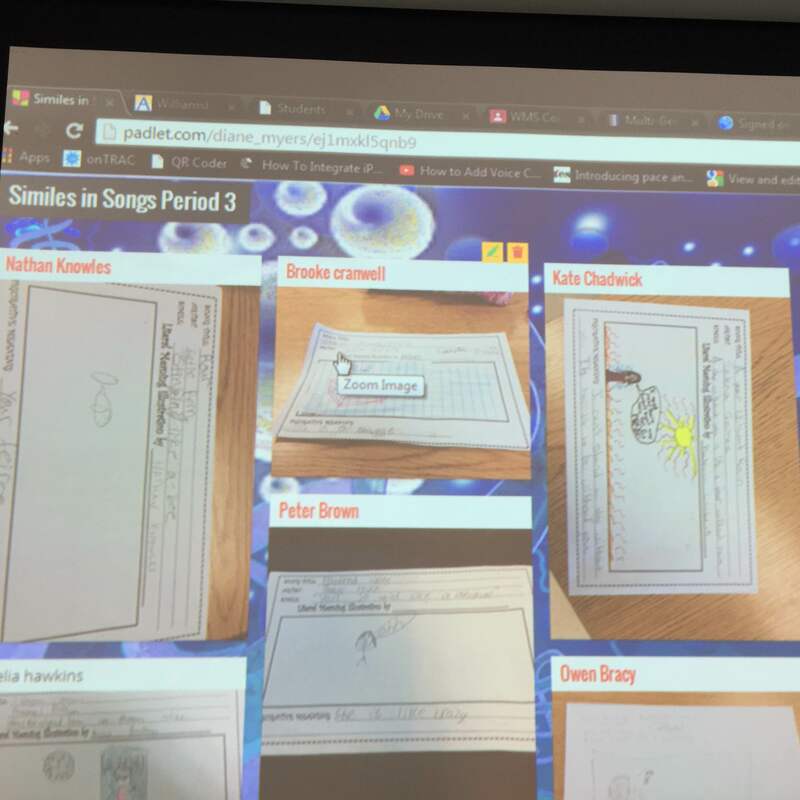 After reading and making observations on a series of photo blogs, I told students to document what they noticed on a Padlet I had set up for each period. Here’s a period’s Padlet. Although the noticings on display here are somewhat limited in scope, students were able to touch on the basic elements of a photo blog: content (current and/or important events), format (exploring a topic through the combination of words), and a few text features (images, captions, title in bold). And any superficiality of observation points to nothing other than my own failure setting it up. I called in one of my colleagues to offer some feedback on just what was going wrong. The following chunk highlights the consequences of my failure to provide more structure on the front-end. Most of them were fine browsing the photoblogs on their own. But maybe a half sheet paper would have focused those who weren’t sure what to write (even though you have it clearly written on the screen). The writing part was lost on them. Maybe they could have made a chart in the notebook before they moved to their groups. XXXX was the only one to get started independently. XXXX did as well. XXXX’s group then got started. The feedback is spot on. I’m certainly not saying that a mere graphic organizer would have radically altered the trajectory of the initial days of the project. The amount of factors interacting at any one time in a classroom resist any sort of totalizing ‘one cause = one effect’ logic. But my colleague’s feedback reminded me to think through the ramifications of seemingly simple classroom decisions. After charting our noticings, students answered three basic questions about photo blogs. First, what topics do photo blogs cover? Then what type of work do photoblogs seem to require? And lastly how do authors of photoblogs make their work compelling? Students put their answers up on large sheets of butcher paper around the room. The goal here is to saturate the analog and digital space of the classroom with information about photo blogs. Here’s one of the charts. By this point students had spent a couple of days immersing themselves in photo blogs and coming up with a definition of exactly what this genre is, what it attempts to achieve, and how it attempts to achieve it. We knew we had to create a brief intro, a body composed of pictures and captions, and a brief conclusion. I wanted my students to pursue the concept of ‘belonging’ in their own way. This meant each student had to develop a central question to guide his or her work. We accomplished this by typing out potential questions into a shared Google Doc for all to see. Again one of the goals is to surround students with questions and information to remind them of all the different avenues of thought for whatever we’re working on at the time. Students’ questions were great. Here’s a screenshot. So, with questions firmly in head, we were ready to break out into the hallways of our middle school and take some pictures. 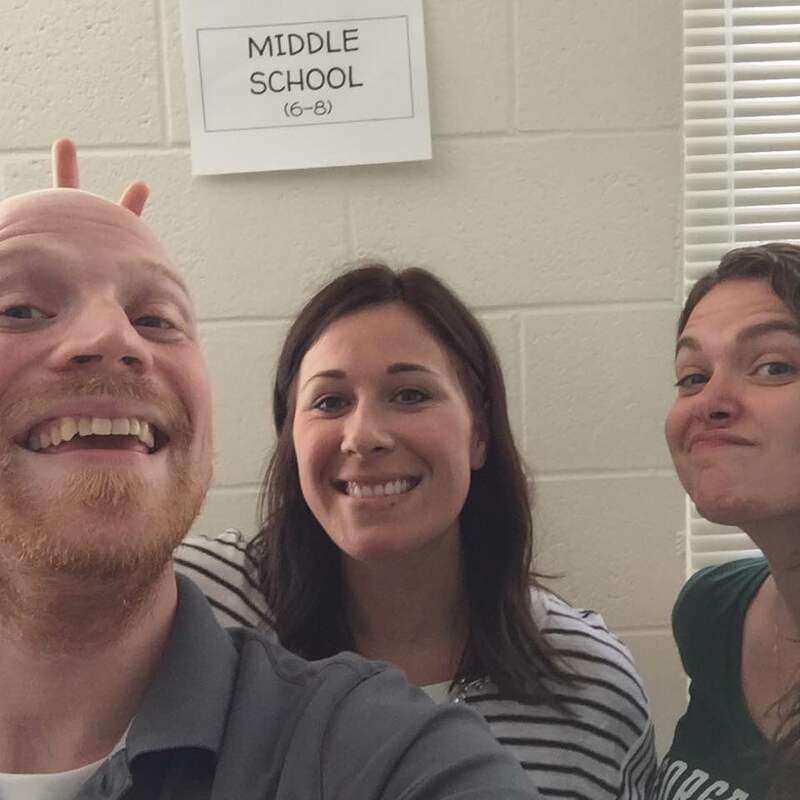 In a rare moment of foresight, I made sure to send out an all-staff email a few days prior explaining that 7th graders would be storming through the building to take pictures. Unfortunately that’s about as detailed as my picture-taking plans were. In my mind I saw kids slinking around the building like investigative reporters, documenting that fantastic mixture of banality and triumph that middle schools seem to produce in spades. This didn’t happen. Instead students ran through the hallways causing a ruckus, taking selfies, and busting down classroom doors to get the drop on unsuspecting classrooms. Of course that happened. 7th graders let loose in sacrosanct hallways armed with connected weapons of disruption. I was mortified. My students were acting rambunctious and disruptive. I often feel like my command of a class is one child’s exaggerated sneeze away from total disarray. I can only imagine how distracting it would be to have a bunch of small faces popping through doorways and peeking through window blinds. I took a few minutes at the end of the day to debrief on the experience with my students. Much to my surprise, many of them mentioned how awkward they felt. Many of the girls in particular expressed a surprising level of unease with the entire endeavor. I didn’t know what to say. I hadn’t considered the inherently invasive nature at the core of this project. I felt terrible. I’ve documented my difficulties with perfectionism before, so I won’t belabor the point here. Although I will admit that a part of me reveled in the “chaos.” What’s wrong with running around and having fun? Seeing finding me perched despondently at my desk after the final bell, my team’s amazing math teacher reminded me that the best lessons aren’t always the ones where students walk away feeling happy. He said that taking risks and pushing our boundaries is, for most people, an inherently unpleasant process. Learning is in many ways a disturbance to our cognitive sense of equilibrium. For this project it was clear that both the students and I were outside of our comfort zone. En route to work the next morning I had a minor epiphany: interviews. By requiring my students to speak with others about issues of belonging at our school I could A) minimize hallway disruption, B) increase student-to-student interaction, C) insert some structure into the process, and D) include interview segments (an important part of the photo blogs we examined). So as soon as I got in that morning I sent out a few emails to other teachers to set up times for my class to come in and interview other students. This phase of the project was a success. Kids wrote follow-up questions to their main belonging question, interviewed one another, and got permission before taking pictures. After a couple of days of taking pictures in class, out of class, during lunch, etc., it was time to begin making our photo blogs. Although the photo blogs we examined as a class were all single page documents, I knew we had to go a different route. Anyone who has used Google’s Documents app on the iPad can attest to its stupefying lack of features. We needed an alternative. Since we’d used Google Slides for our Q1 electronic portfolios, I decided to go with a Slides presentation for the photo blog. Students already knew how to create links, crop images, add captions, etc. Most students required two to three full class periods to complete their five slide (minimum) photo blog. To help students write their conclusion, I asked them to try and figure out what story their words and images told. What did their interviews reveal about belonging at our school? How did each image contribute to the overall thrust of the presentation? The image below is a quick organizer I put together to help students work through these fairly abstract questions. The text in each box is from the photo blog I created concurrently with the kids. 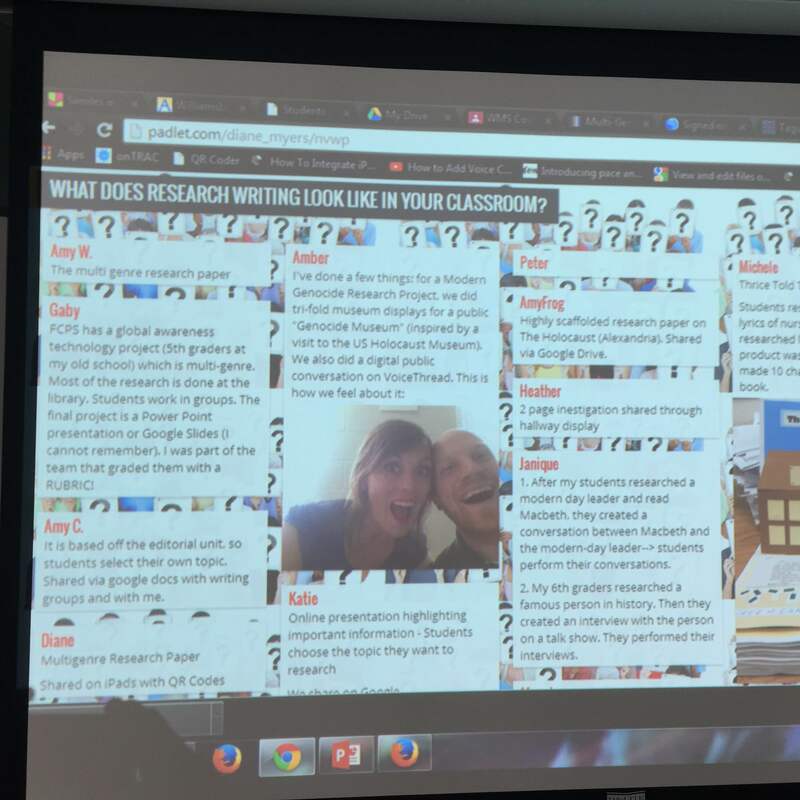 To help the photo blogs reach an audience larger than the four walls of my classroom I asked students to insert a QR code into their favorite slide. I then printed out each student’s QR code slide. Students put their slide images up on display all around the building. Since my district has a QR code reader on its app catalogue, every student and faculty was able scan the code and access each child’s entire photo blog presentation. I thought this was a fantastic way to get around the understandably strict internet policies at my district. Many of the kids seemed non-plussed. I pulled the following images from a diverse range of students. This project fought me every step of the way. I didn’t build in time to help students edit their photo blogs, and as a result almost every project contains a handful of typos. I also didn’t push students hard enough on the analysis sections of their conclusions. I should have found a way to help them take their findings to the next level. I (and most likely you) can rattle off a list of the many pedagogical failings at work on this project. I will return to this project next year. The potential for students to interact and comment on their school’s culture is too great to ignore. Thanks for reading the first Lesson Lab installment! The end of the quarter is always chaotic. Since I don’t use grades, I need some way to help students sort through nine weeks’ worth of activities. My district requires a single letter grade for report cards, however. So after a few reflection and curation activities students compose a grade reflection essay assigning themselves a single letter grade. Students compile all of this into a portfolio. I’ve been tinkering with portfolios for the last three quarters. This year I decided to embrace my district’s iPad adoption program and take student portfolios online. What follows is a brief description of how I approached electronic portfolios this quarter. I’ve attached the Google Slide presentations I used just in case you want to modify and use them yourself. I started out by creating a Google Slides portfolio template. I shared this template through Google Classroom, making a copy for each student in the process. The portfolio template is a pretty bare bones affair. It begins with a table of contents slide. Each item in the T.o.C. links to its corresponding place in the presentation. I was originally going to have students create the links themselves, but the iPad version of the Google Slides app doesn’t allow for link additions. It also helped students focus on the actual content of each slide. Once the template was done, it was time for our first portfolio lesson. Here’s a link to the slides. I make a Google Slides presentation for every day. It helps me keep my ideas sequenced correctly and provides useful visual reminders for students. That’s why you’ll see my TA/homeroom instructions, warm-ups, etc. Students first had to rummage through their binders and brains to find one piece of work that exemplified their effort, growth, and experiences during first quarter English. I call these ‘learning artifacts.’ It’s tough to reduce an entire quarter down to only a single learning artifact, but I wanted to keep their first time relatively simple. I’ll up the amount for each quarter; quarter two will require two learning artifacts and so on. After discussing what makes an effective vs. ineffective artifact (pushed you! you’re proud of it! you took a risk! 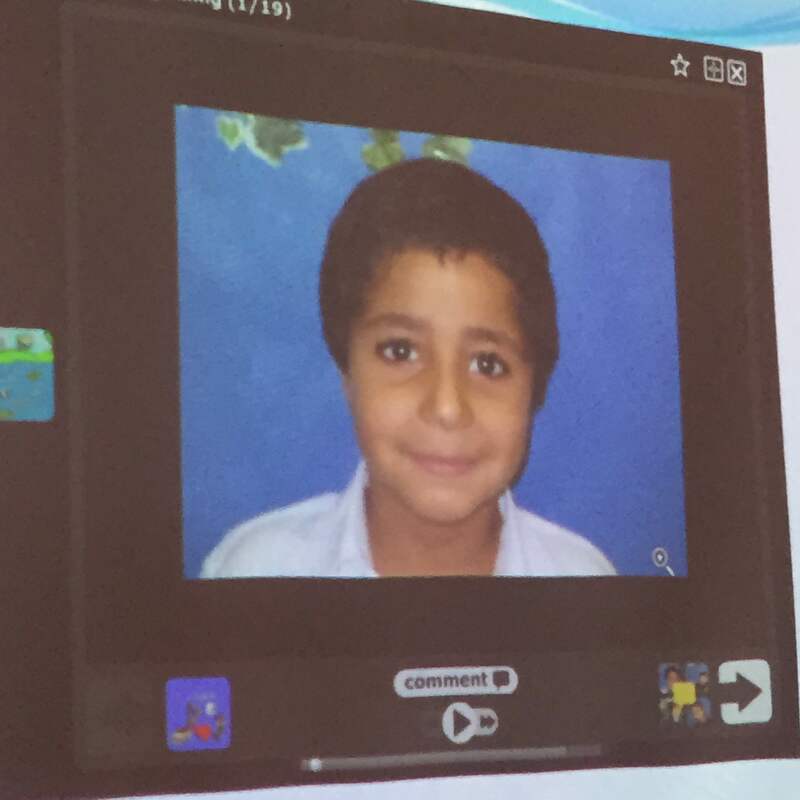 ), students took a picture of the artifact and inserted the image onto the ‘Learning Artifact’ slide. 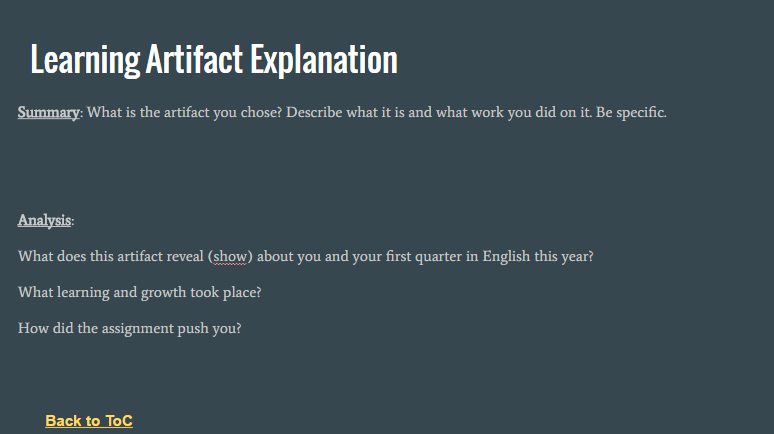 Then it came time to write the learning artifact explanation. I broke this down into two parts: summary and analysis. The summary consisted of more factual/reporting type questions. What is the artifact? What did you do on it? The heavy lifting comes in the analysis questions. What growth or learning occurred as a result of the artifact? 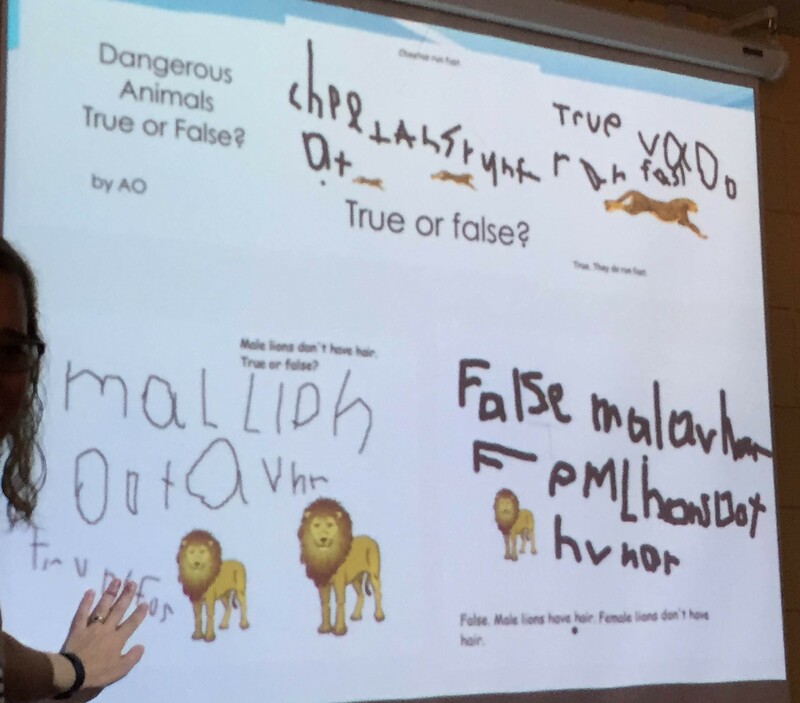 After answering the questions directly onto the slide, students deleted the questions themselves and arranged their answers into a rough paragraph. Tomorrow I’ll talk about the next step: students create analogies to reflect on and make sense of their quarter one English experience. Next up is Heather Jung! Heather wanted to make writing meaningful for her small group instruction. She talks to us about how our lower-SES students do have access to technology; they just don’t know what to do with it other than play games and buy stuff. So we need to teach them to use technology to help them work on higher order tasks. 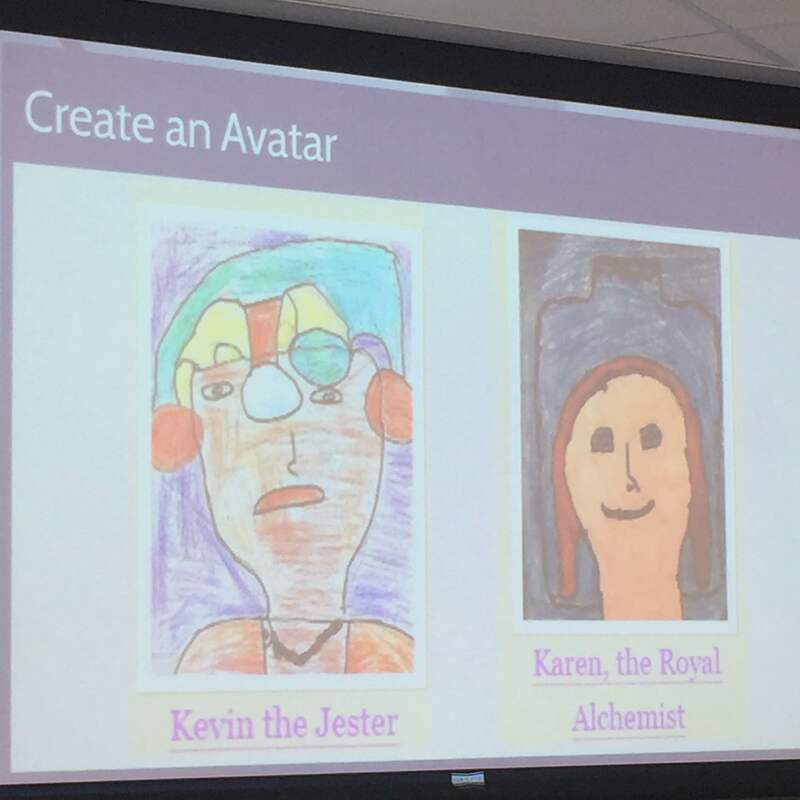 Step One: Students to create their own avatar. Step two: Create a web page! Heather does them through her own Google account. Step three: Read! Read! Read! Step four: Genre study! 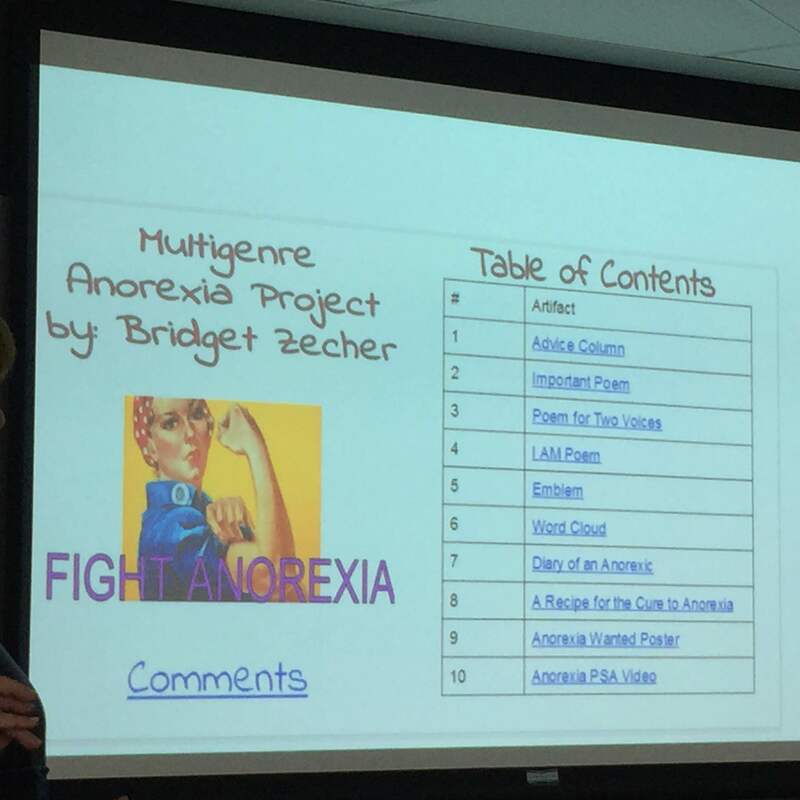 Heather found many examples of accessible book reports done by children similar to her own population. This is another example of the power of the inquiry model (again, think Katie Wood Ray and the power of immersing ourselves and students in examples of a particular genre. This is particularly useful in helping students identify and internalize specific genre characteristics.) Heather found these from the Spaghetti Book Club. Then, true to the inquiry model, we use these genre characteristics to write our own book review. Jal Mehta’s ambitious book attempts to trace the rise of standardization and rationalization throughout the history of American education. He does this by focusing on three major education reform movements: the Progressive Era (1890-1920), the forgotten Standards movement (1960-1970), and the No Child Left Behind reforms (1980 – ). Jal’s book investigates the connections between politics, culture, and education to ultimately argue that the rise of rationalization has negatively impacted education. Heather then shows off some of her student’s work. 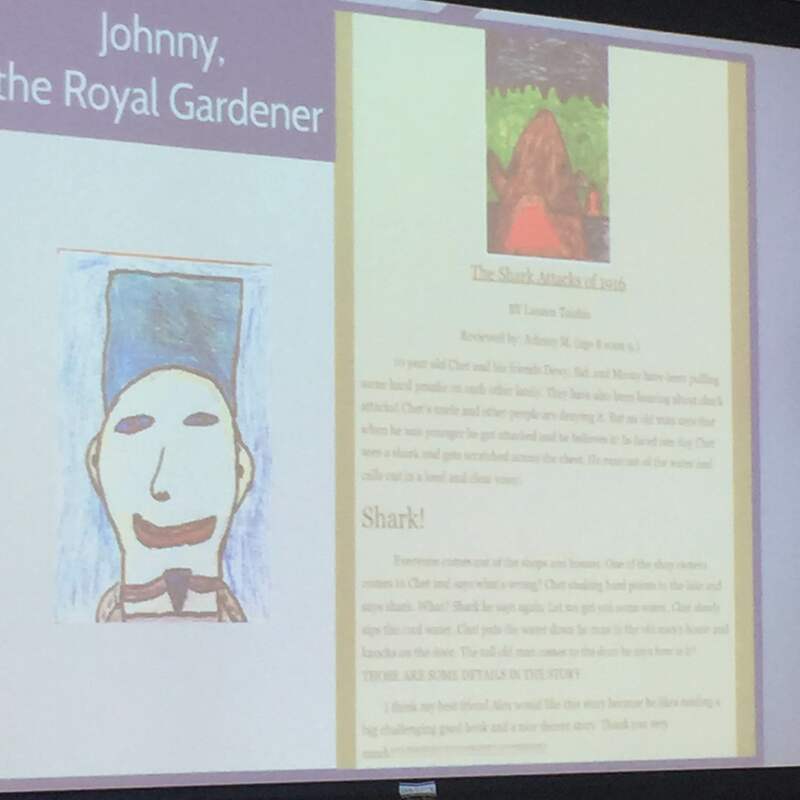 There are some connections here with the value of illustration in the writing/reading classroom. Step four: Read and comment on each other’s writing using Disqus, a website devoted to online discussions about pretty much anything. There are channels devoted to a variety of topics, as well. You can add a Disqus button to Google Sites as a gadget. This lets students use Disqus to comment and respond to each other’s posts. She shows us how her students would often “like” and respond to comments made by each other while passing over those from their teachers. Heather tells us that parents loved the “open access” of her Google Sites page. What an excellent morning! Now we’re off to lunch and writing groups. Enjoy! Our final week! We are bummed. Our first presentation is Diane Myers. She gets us moving with a Four Corners activity: how has research changed over the years for you professionally or personally? We move to a corner of the room corresponding to our grade level. Our middle-school group talks about the challenges of research in the 21st century. As teachers we often struggle with how to handle research in a way that honors both the analog world (books, libraries) and the digital world (databases, boolean searches). We then share out whole group. Some of us mention that the nature of the research project matters greatly. Since a research paper has so many components within it (indexing, searching, skimming, bibliographies, citations, MLA/APA style, etc.) that the actual research/learning often gets lost. Is this source reliable? Is this article credible? My neighbor mentions how important it can be to give the students the information that they need to help them research vs. making them do every single part. Many of us have great relationships with librarians. Diane is going to talk to us about the final step of the research project. The communication of information. When we think about what we want our children to learn, the communication of information is pretty important. She sends us to Padlet. (A free app/website) Padlet is a great place to share information with a larger audience. Sort of like a Google document only more visual. Everyone has their own space and students can’t mess with each other’s typing. All you do is double-click anywhere and start typing in your box. And in each box you get to insert links, images, videos, etc. Diane uses Padlet for many things including homework. In the following pic students did their homework, took a picture of it with their iPad, then posted it on a Padlet Diane set up. OK. 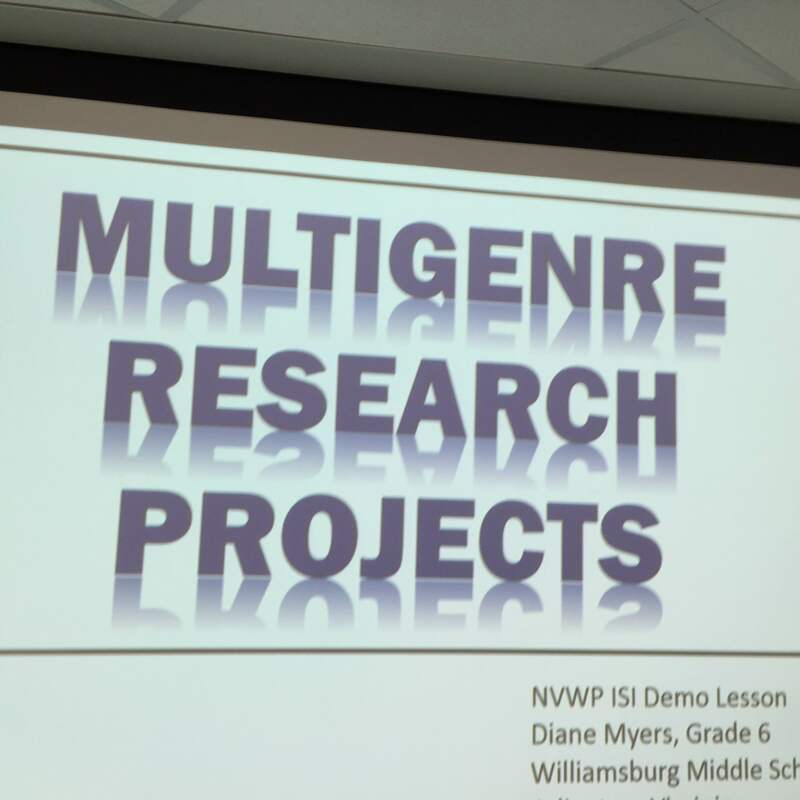 So, what is a multi-genre paper? –It arises from research, experience, and imagination. –Composed of many genres and subgenres, each piece is self-contained, making a point of its own, yet connected by a theme or topic and sometimes by language, images, and content. –May contain many voices, not just the author’s. 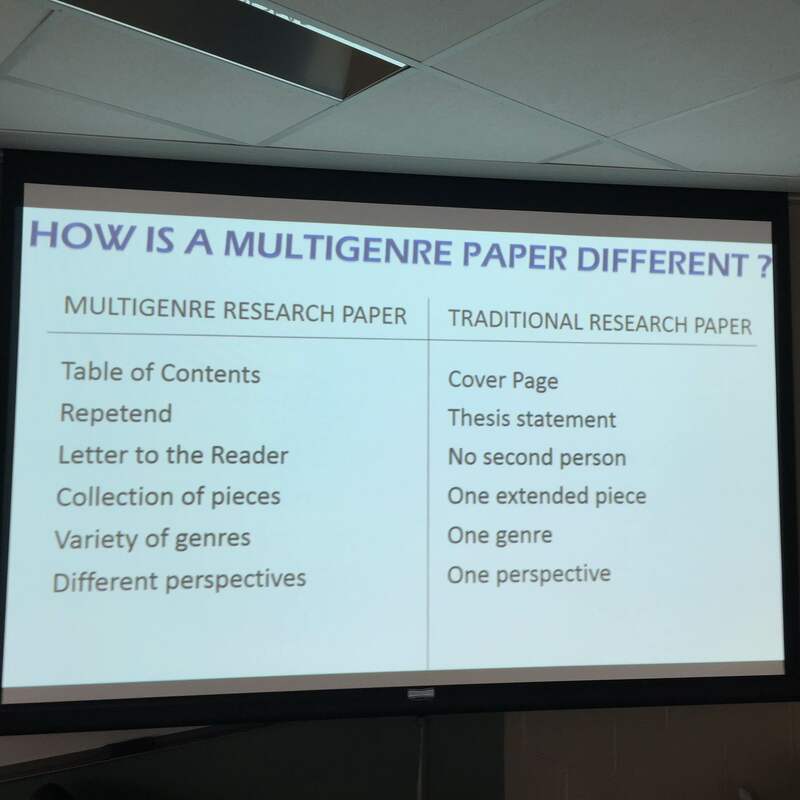 How is a multi-genre paper different? Diane takes a minute to tell us about Tom Romano. Most credit his book Blending Genre, Altering Style with kicking off the multi-genre project. There are tons of resources online about this, as well. 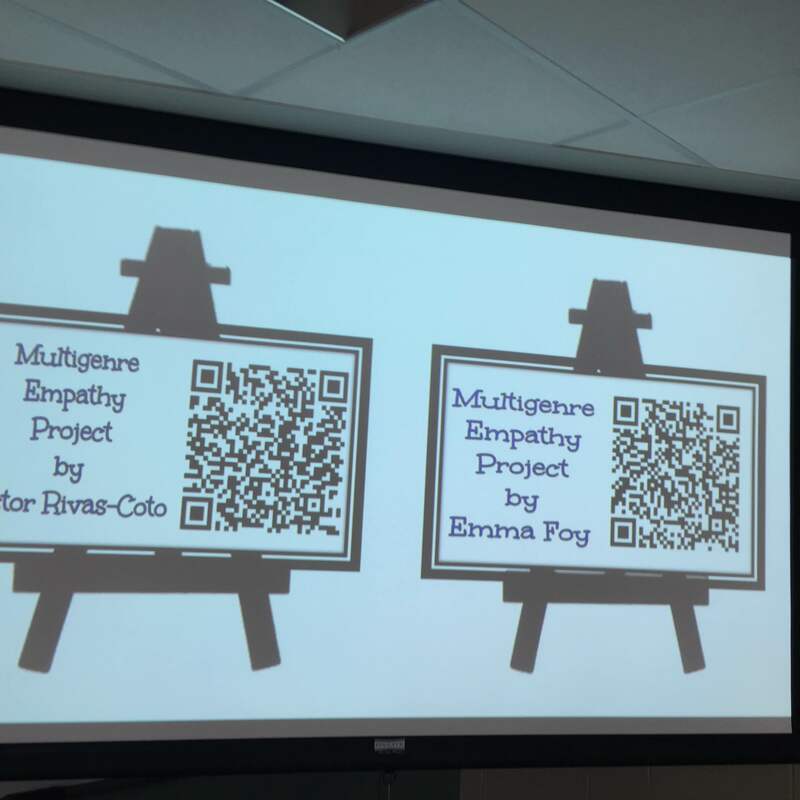 When it came time for students to share their multi-genre research projects, she had each student make their own QR code that linked to their Padlet. So, students had an empathy unit where they investigated topics such as post-traumatic stress disorder, dyslexia, ADHD, biploar, etc. 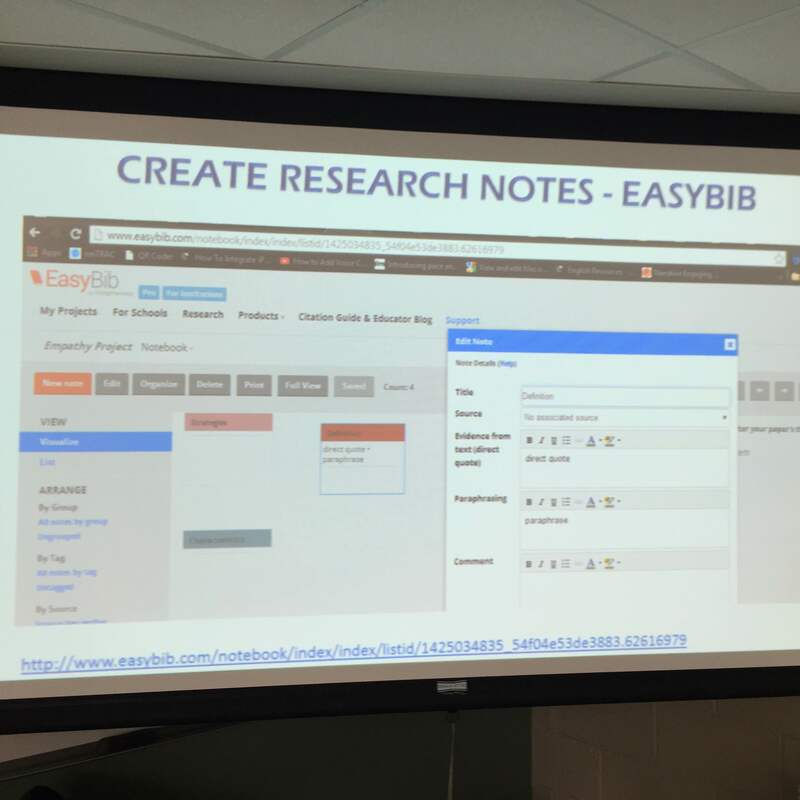 They then created research notes using Easybib, a free program that helps students organize research, create notes, paraphrase, create bibliographies, etc. Then they export it to Google! When I think about the power of technology in the class, I think about how it renders obsolete many of the small tasks we adults associate with classroom tedium. Bibliographies, where the comma goes, etc. As superintendent Josh Starr said, if you can Google it, why teach it? Each hyperlink in the table of contents takes you to the particular assignment which is in Google Docs or Google Slides. At this point the collective jaws of the room are on the floor. Diane then brings us to the big daddy of classroom tools: www.classtools.net. This site has all sorts of amazing ways to let kids take advantage of technology in a controllable format. SMS generators to make student made text message conversations look authentic, Fakebook pages, video game screens, etc. You must check out this site. Now we get to try! DIane passes out a fact sheet she’s made for the sake of this presentation with information about mental health conditions. Then, she gives us our multi-genre artifacts. 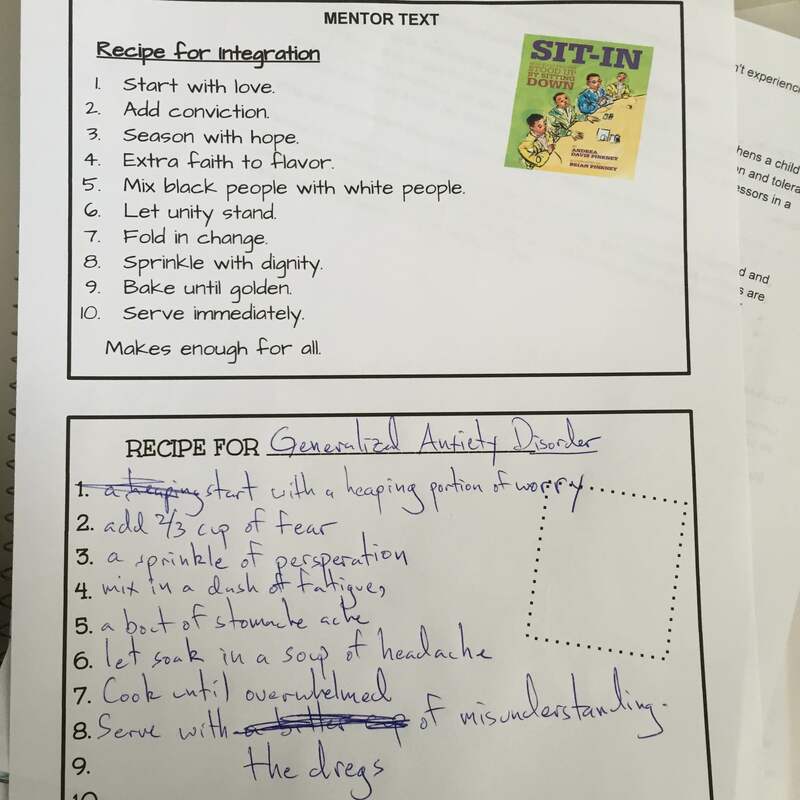 My partner and I had to create a recipe for Generalized Anxiety Disorder. Diane tells us you can differentiate by having some of the genre artifact planning pages have sentence starters. We share out. THEY ARE AMAZING. Advice letters about kids with ADHD. I Am poems about Autism. Absolutely fantastic work, Diane! Next up is Teacher Consultant Jennifer Orr. Quickwrite1: On a scale of 1-10, how challenging is writing for me / my students? Why? I don’t think I could reduce the difficulty of writing down to a single number because, like everything, context matters. There are times when I just get in the zone. When it feels like the words and sentences are pre-ordained and I’ve somehow gotten lucky enough to stumble into the flow. Those are the times when I feel like a vessel, a conduit for expressing what’s already in the aether. Then there are times when every single word is a challenge. When eeking out a sentence feels like pulling my own teeth. This is also what I see in my students. The herky-jerky stop and start of in the flow vs. out of the flow. Catching the tail end of a sentence or two only to lose it the very next second. Sometimes the beginning is easiest. I can burn through my first thoughts (which are usually pretty similar) at a quick pace. But when I have to start really digging deep, that’s when it can get difficult. We share! Here’s a collection of things everyone says: how the difficulty of a piece affects how challenging the writing is. For many of us, the writing process spans from 1-10, often times within the same paragraph (for me, at least). Some of us write things we know we’ll have to take out later. The genre of the piece and the audience and the subject seems to dictate the number we select for ourselves and our students alike. We talk about high stakes vs. low stakes. 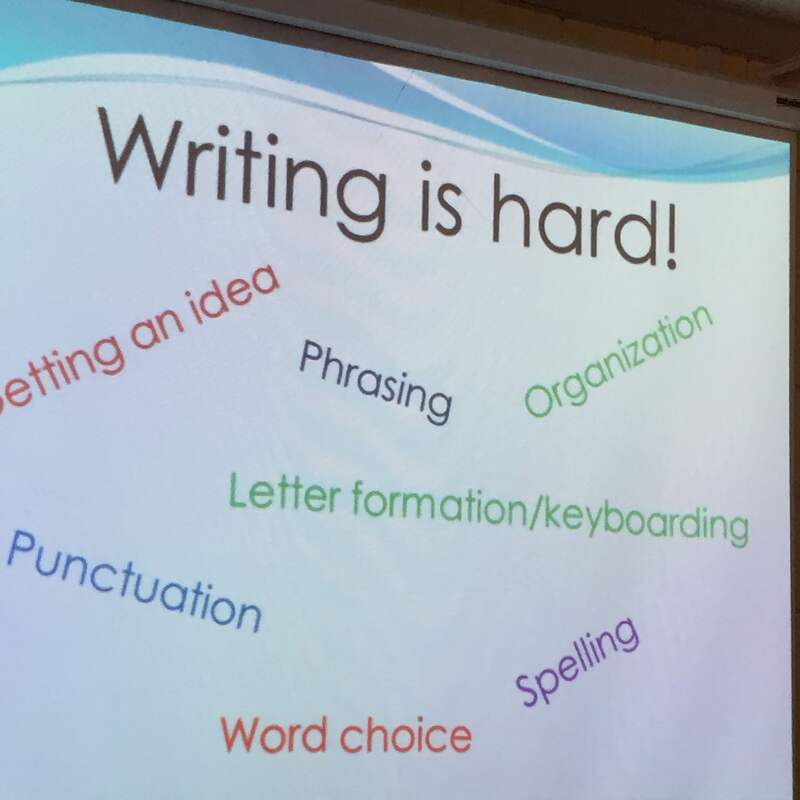 Also maybe that our students don’t really have a sense of what writing is difficult and what isn’t, or when it’s challenging and when it isn’t. 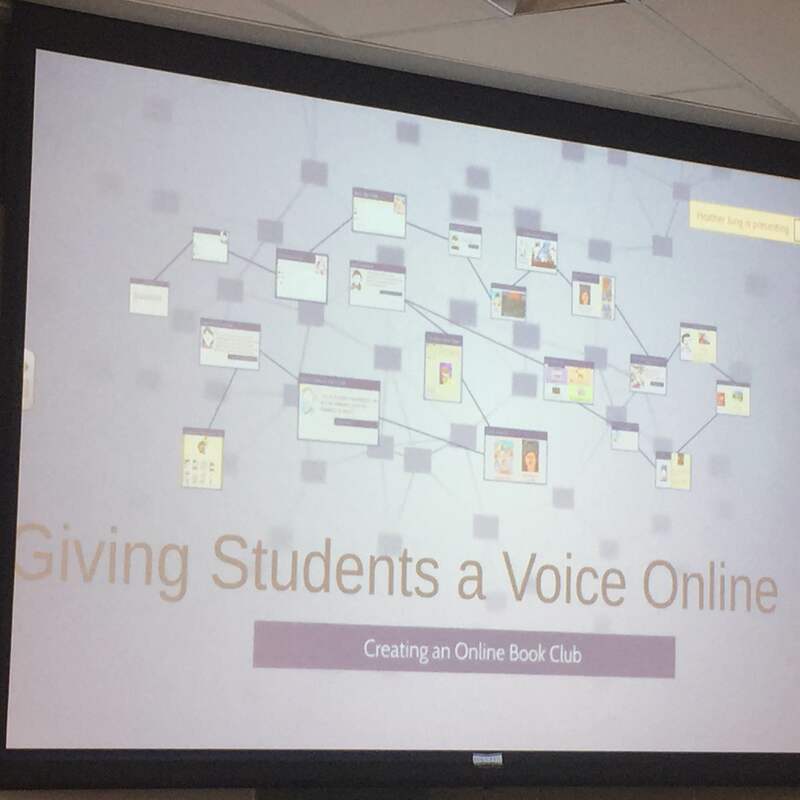 Jen talks about the disconnect between the stories students tell and the stories students write. They can spin for us the most elaborate stories, yet when it comes time to put it down on paper something happens and the rich tale becomes two anemic sentences. Writing is often seen by students as something you only do because you’ve been told to do it. This is the problem that led down the path of education technology. What follows is what she says. Pixie – ;records the voice and allows the student to focus on the craft of writing and not just copying it down from memory. You can record it in video form, add in some rudimentary images. This lets students tell their story without getting hung up on the mechanical act of etching graphite letters onto paper. Geared towards a younger audience. Voice Thread – Lets you record ideas so you can then focus on the organization and sequencing. Lets you record, mark up with text, sequence images and photos and slides, lets others comment on each other’s stories. You can type them, record them, or video record them. This is useful for research. Kids can set up a series of slides while talking over them. You can also then make them public, allowing parents to comment on them (in any language!). Nice. Jen embeds the videos in the class blog so parents can follow them. Comics/Graphic Novels: Chogger, ToonDoo, Comic Master, Make Beliefs Comix These are free tools that help students create graphic novels, text bubbles, etc.! Voice Thread – Making a voice thread of the child reading their draft, requiring them to read it aloud. Quickwrite2: Which is more challenging for you as a writer: composing or revising/editing? What about as a teacher? What about for the students? For me, the hardest part of the process is definitely the revision. This is because of the Jackson Pollack style of writing I prefer. I typically throw up lots of blops and goops of information. Sometimes a page, sometimes a mere sentence. Then, I have to go back through all of it, delete, add, reorder, etc. Actually put together a coherent piece out of all of these seemingly disparate parts. Then, once I’ve done that, I usually realize I need to write the whole thing over again now that I’ve got the basic gist down. In terms of teaching, I find both of them difficult, albeit it in different ways. Teaching revision is difficult because of the “one and done” syndrome plaguing pretty much every writer who isn’t professional. Teaching editing is a challenge because most of them automatically tune out the second they hear talk of commas and periods and punctuation. We discuss our answers. So much good stuff! Which is hardest? I think revision can be easier to teach because they’re often strategies and tools. 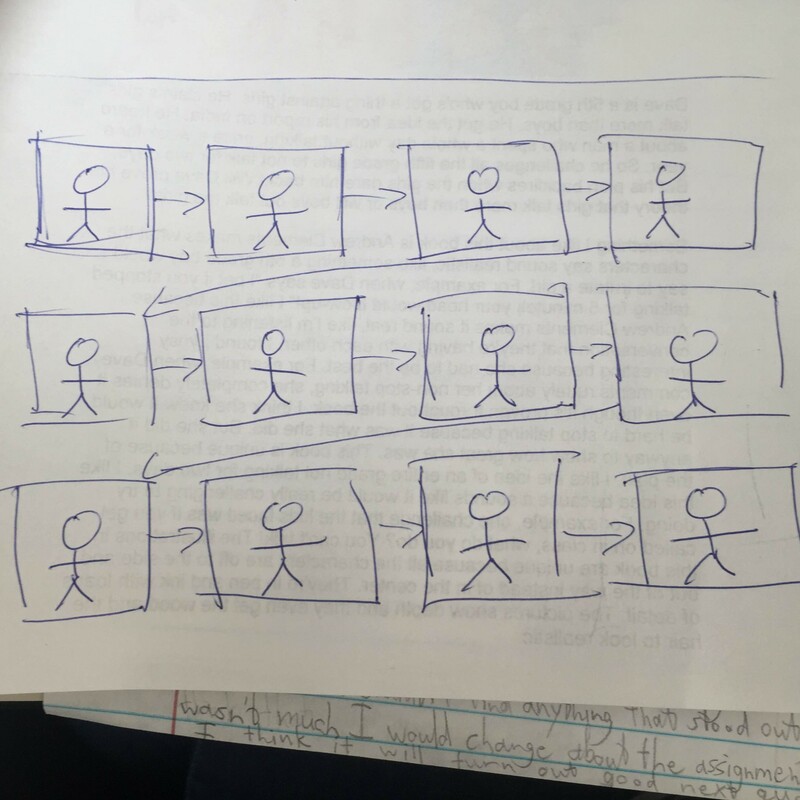 Teaching proper editing requires understanding of a more complex system of interrelated pieces. Jen finishes up by telling us how important it is to give the students an authentic audience beyond the teacher. This doesn’t have to be major. Hang these up in the hallway. Post on a class blog (hers is ExploreOrrs. It’s amazing! Check it out! Notice the no names, the no school identity, etc.She uses Google Translate for the Spanish translations. Jen starts out doing the blog entirely herself. Throughout the year she gradually releases the responsibility to the students). School newspaper. Morning announcements. 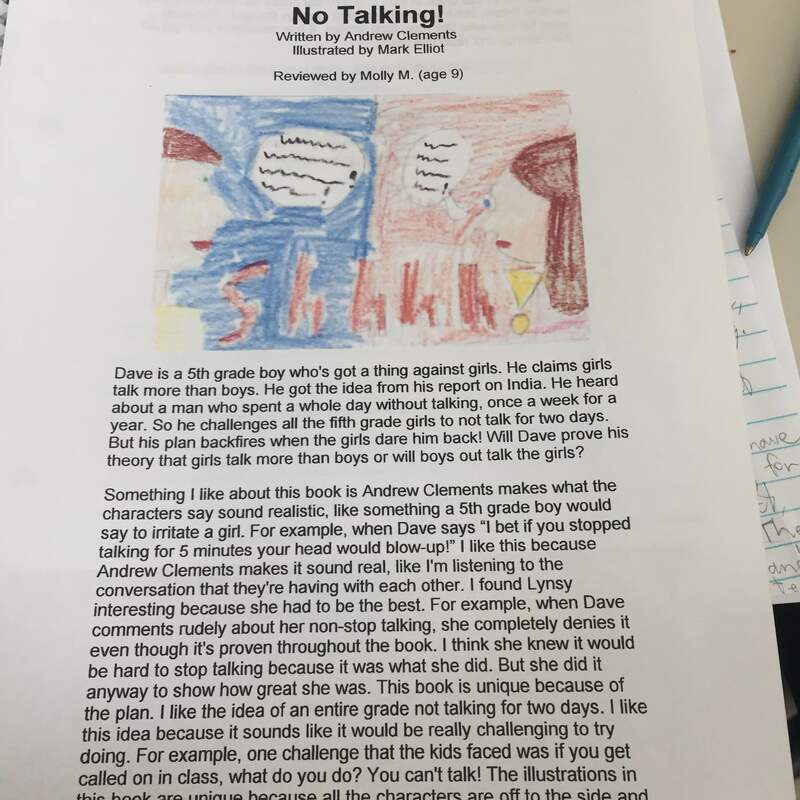 Print out student work and keep them in the classroom (make sure to label it! ).